For many British moth enthusiasts the appearance of Black Rustics at light traps in the autumn is a depressing sign that the summer has gone and winter is on its way. The huge moth catches at the height of summer will soon be memories, squirrelled away as black numbers in recording diaries. 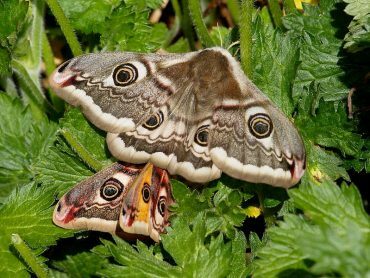 The colder the days and nights, the fewer the number of moth species on the wing. Of course, things are not as gloomy as one might think: the early morning rises at the crack of dawn to beat the birds from eating any moths scattered around outside the trap will not be missed; and a break from the hours spent logging and photographing the catch is also welcome. With the changing of seasons also come different species of moth sporting the latest autumnal range of camouflage, reflecting the reds and yellows of dying leaves. The Black Rustic is unusual in being one of the few British moths that is almost entirely black which makes it easily identified even when worn. 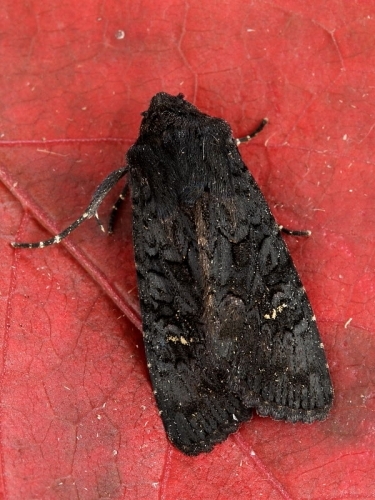 The Black Rustic photographed was taken at the end of September and was attracted to light in a Cornish garden.